This image from Jill and Matt's wedding is full of emotion. They had their ceremony and reception at Pearl St. Grill and Brewery in downtown Buffalo. Both of Jill's parents had passed away, so her nephew had the honor of escorting her down the aisle and giving her away. He was so full of energy before the ceremony. Then when it came time for his job, he turned completely pale. He was so nervous. You can see how serious his face is in this image. Directly after this, he was all smiles and laughs again! 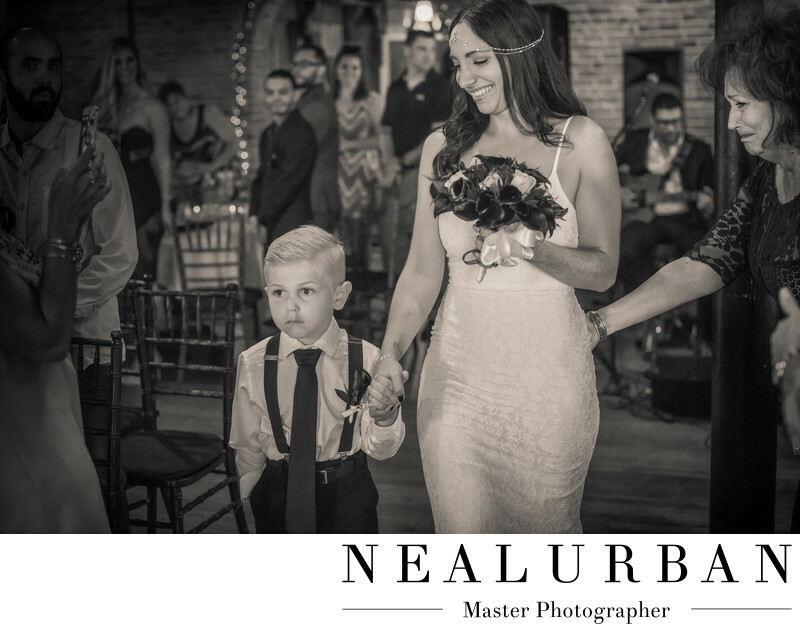 We love the bride's reaction to her nephew. She is looking down at him with a giant smile. She was so relaxed! Then you see the woman to the side touching the back of Jill. She is trying to hold back her tears and she also looks at this little guy. We found out later, this woman was Jill's aunt, who she is very very close with. There is so much going on in just this one image of the bride coming down the aisle. It is amazing some of the things we see and capture. If I was at the altar taking this image, I would have been crying too. Neal was up there, photographing, and I was following the bride from behind for a different angle. We had never met Jill's fiance either before the wedding. We met him day of. He was awesome. Once we posted an image of their wedding online to Face Book, we could not believe the response. We learned that Matt, also known as, Country Matt, was a star on the show Pitbulls and Paroles on Animal Planet. It was so cool! Location: 76 Pearl St. Buffalo, NY14202 United States.